The year was 1974, and former Nazz member Todd Rundgren, who already had a few successful solo albums under his belt, put together a full-blown progressive rock ensemble named Utopia, and set forth to compete with bands such as Yes, ELP, and Genesis. While Rundgren had flirted a bit with the prog genre on a few songs from Runt, Something, Anything, Todd, and A Wizard, a True Star, it was here with Utopia that the singer/guitarist let his songwriting take him to worlds he had yet to fully explore. Joining Todd were three keyboard players, Moogy Klingman, M. Frog Labat, and Ralph Schuckett, bassist John Siegler, and drummer Kevin Ellman, forming a formidable array of talent that helped showcase the guitarist's new, extended songs. 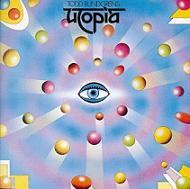 There's no short pop ditty's on Todd Rundgren's Utopia, instead, the album is filled with long form jaunts of space age prog-rock, littered with extended guitar and synthesizer explorations that surely fit well alongside albums like Relayer from Yes, or ELP's Tarkus. Shaped around these lines from Rundgren however is some fierce and powerful progressive rock firepower, and sure to please any fan of the genre. If you are expecting "Hello It's Me", you will be in for a big surprise. Skipping ahead to song number two, we have the varied sounds of "Freak Parade", a quirky and mysterious number that is entirely different from the preceding track. Kicking off with a bouncy keyboard medley filled with counterpoint ala Gentle Giant, Rundgren then enters the fray with some weepy slide guitar accompanied by funky Fender Rhodes electric piano, which segues the piece into a complex medieval sounding jaunt that could have easily come from Three Friends or Octopus. Before you know it, the band changes gears and blasts into a funky groove that will remind you of Frank Zappa's late 70's output, led by Todd's New York style vocal rants and layers of electric piano. The tune has is all, rock, prog, jazz, funk, and even some avant-garde fusion. Think Herbie Hancock meets Frank Zappa meets Gentle Giant and you have an idea what to expect on this one. The albums lone short cut is "Freedom Fighters", a hard rocking yet spacey piece that contains the trademark Rundgren melodies and vocal harmonies, especially on the chorus, as well as symphonic synthesizers and chunky guitar riffs. Todd's guitar solo reaches for the stars on this one, and his rhythm playing is as raw as the early work of the Who's Pete Townshend. At just over four-minutes, it's long by 1974's standards, but for this album it's a mere speck compared to what was to come on the next and final track. At just over 30-minutes in length, "The Ikon" is art rock at its finest, bringing to the table the fusion muscle of bands such as the Mahavishnu Orchestra and Return to Forever, as well as prog legends such as Yes, ELP, Camel, and Focus. Here, the three keyboard format works to its fullest, as Klingman, Labat, and Schuckett add in layer after layer of varied keyboard sounds using Moog, Fender Rhodes, and organ, creating a huge wall of sound over which Rundgren's vocals can soar. The song takes many paths, changing tempos and moods often, at times broken up by a searing, effects laden guitar solo from Rundgren, a wild Moog passage from Labat, intricate rhythms from Siegler and Ellfman, or an atmospheric section made tranquil by multiple keyboard sounds. Again I am going to reference Relayer by Yes, and there is a reason why. Many of the passages on this song have that frantic, progressive fusion vibe that Yes really hit home with on that album, and the interplay between the keys and guitar is quite similar in both instances. During the vocal sections, Rundgren's singing takes on a space age tone (no doubt Trevor Horn was greatly influenced by him on future releases from The Buggles as well as the lone Yes album he appeared on, Drama), complemented nicely by swirling organ and electric piano. However, it's his guitar playing that once again stands out, as during his first extended solo he starts off with melodic and chorus laden legato lines before ending with some fast picking triplets dripping with funk passion. There's also a furious Moog workout from Labat about mid-way through the piece, which then eventually leads to a wild battle between Rundgren's guitar, Siegler's bass, Ellman's drums, Klingman's Fender Rhodes, and Schuckett's synth, done in a style that Chick Corea would later make famous with The Elektric Band, and Rundgren would also reprise on the Utopia album Ra. While this extended piece is perhaps best appreciated with headphones, where you can really digest all the varied sound that are assaulting your senses, it's also a piece that sounds great cranked up to 11 on your stereo (oops, sorry for the Spinal Tap reference folks!) for a huge wall of sound. The Ikon is one of prog's best epics, and sadly does not often get mentioned alongside other long form prog rock songs like "Supper's Ready", "Thick as a Brick", and "Close to the Edge". Rundgren would return briefly to the long-form opus format on his 1975 solo album Initiation with the 36-minute instrumental "A Treatise On Cosmic Fire", as well as the epic "Singring and the Glass Guitar" from 1977's Ra, but neither came close to the majesty of The Ikon. This was the first and last Utopia album to contain this exact line-up, and although the band would go on to record many more albums with the popular configuration of Rundgren, Roger Powell, Kasim Sultan, and Willie Wilcox, only the follow-up Another Live, 1977's Ra, and parts of Oops! Wrong Planet and Adventures in Utopia had progressive rock elements. None of these though came close to the wonderful sounds of Todd Rundgren's Utopia, which to this day remains a classic, if not an underappreciated gem of the genre.